Sometimes, you’ve just got to take control of your own destiny. Trevor Jackson came to that realization in late 2014. The 19-year-old singer, songwriter, performer, dancer, and actor had returned home from touring behind his 2013 debut #NEWTHANG EP [Atlantic Records], and he really wanted to get his next project out to the masses. He’d already delivered fan favorite trackssuch as “Drop It” (Remix) [feat. B.o.B], “Know Your Name” [feat. Sage the Gemini], “Like We Grown,” and “Me Likey” [feat. Kirko Bangz], and packed houses alongside Diggy Simmons and others. So, he wasn’t going to wait around or rely on anybody else to influence the vision for what would become his 2015 mixtape In My Feelings. Instead of relying on producers and writers, Trevor turned to his older brother Ian. The two of them began co-writing together and tapped into a chemistry that only family could channel. As a result, the project flows seamlessly from start to finish, following a narrative thread. It begins with a phone call between Trevor and his grandmother who mistakes him for his dad. 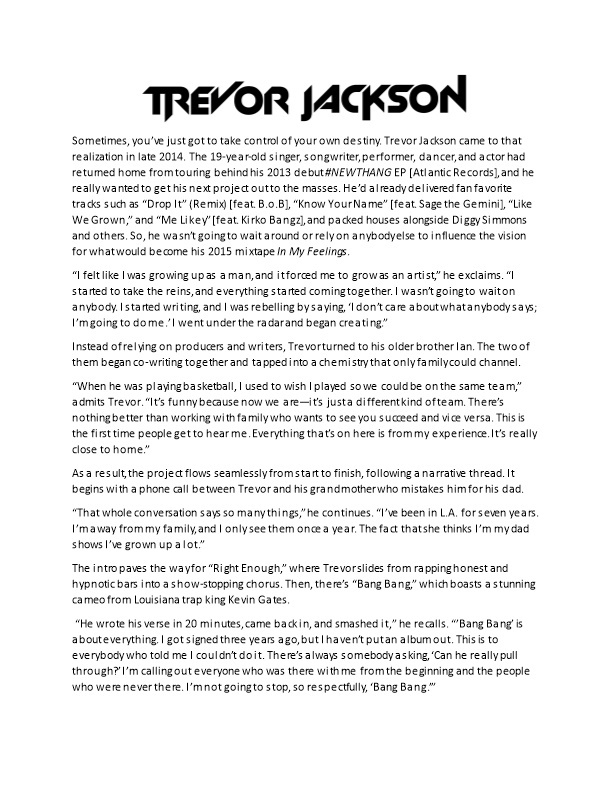 The intro paves the way for “Right Enough,” where Trevor slides from rapping honest and hypnotic bars into a show-stopping chorus. Then, there’s “Bang Bang,” which boasts a stunning cameo from Louisiana trap king Kevin Gates. On the focus track “Simple As This,” airy production and keys complements a sparse beat that gives Trevor’s dynamic voice space to really shine. Nodding to a favorite from his idol Michael Jackson, “Dirty Diana,” it’s as seductive as it is soaring. Trevor first captivated millions on-screen, after a three-year stint as Young Simba in Disney’s Tony Award-winning Broadway National tour of The Lion King. His credits include the SyFy original series Eureka, CBS’ Criminal Minds, the Disney Channel’s Let It Shine, as well as Harry’s Law for which he received the 2012 Young Artists Award in the category of “Best Performance In A TV Series – Guest Starring Young Actor 14-17.” Plus, roles in two upcoming movies Sons to the Grave and Juveniles. Continuing his on-screen success, Trevor has recently earned himself a series-regular role on Season 2 of John Ridley’s ABC drama series American Crimealongside André Benjamin and Regina King. His character will add even more suspense to the already thickening plot.